Baseball pioneer and Hall of Famer Albert Spalding played for two early major league teams in the 1870s, the Boston Red Stockings (who later became the Braves) and the Chicago White Stockings (later known as the White Sox). Towards the end of his playing days he helped form the National League and, with an eye toward life after baseball, started a sporting goods store with his brother in Chicago in 1877. When he was 51 years old he moved to San Diego, California, and built a home near the cliffs of Point Loma. His home was located in a community known as Lomaland, a Theosophical commune started in 1900 by Katherine Tingley. Constructed in 1901, Spalding’s home was a one level Victorian style home. The home was painted white as were all the other buildings that made up Lomaland. Spalding lived in the house until his death in 1915 at the age of 65. The Theosophical community departed Lomaland in 1942 and the land and buildings were subsequently purchased for use by Balboa University. Spalding’s home and the remaining buildings that made up Lomaland are now part of Point Loma Nazarene University. Spalding’s former residence, known as Mieras Hall, houses the office of the university president and the office of academic affairs. Just to the south of Spalding’s former home is the Carroll B. Land Baseball Field. The baseball field, with its modest seating area, has to be one of the most beautiful in the United States. Set on the cliffs of Point Loma, the Pacific Ocean is located just to the west, beyond the outfield wall. The Albert Spalding Home and Point Loma Nazarene University are located seven miles west of Petco Park, Home of the San Diego Padres, just across San Diego Bay. Like the Boyhood Home of Ted Williams, the Spalding Home is worth a visit because of its connection to a baseball Hall of Famer. Carroll B. Land Baseball Field at Point Loma Nazarene University is worth a stop as well, if for no other reason than to experience the beauty of the ball field set on the cliffs of Point Loma, overlooking the Pacific Ocean. Braves Field was the second home of the National League Boston Braves. Previously having played at the various incarnations of stadia at Boston’s South End Grounds, the team moved to Braves Field in 1915, playing there through the 1952 season. Braves Field is located just a mile west of Fenway Park on Commonwealth Avenue. The ballpark, or what is left of it, resides on the campus of Boston University. After the Braves left Boston for Milwaukee in 1953, the university took over the ballpark, demolished a portion of the field and grandstand to construct a gymnasium, and converted what was left of the grandstand and most of the outfield to a modest-sized football stadium. When Boston University disbanded its football program, the stadium, renamed Nickerson Field, was converted for use primarily as a soccer venue. The distinctive, tan-colored, stucco and Mission-Revival-style building that once housed the Brave’s administrative offices and is now the university’s police station anchors the site on Harry Agganis Way, one block north of Commonwealth Avenue. Just behind building is the back side of the right-field bleachers, also preserved by the university. A concrete plaza constructed behind the police station includes a plaque commemorating Braves Field. The plaque tells the story of the longest game in major league history, played at that field on May 1, 1920. A 26-inning affair, the Braves battled the Brooklyn Dodgers to a 1-1 tie, with both pitchers throwing complete games. A gate between the police station and the right field bleachers allows access to the playing field, which is now covered with artificial turf. What remains of Braves Field is impressive. The seating area of Nickerson Field is composed almost entirely of what once was Braves Field’s right-field bleachers. The original concrete-and-stucco wall surrounding the perimeter of the bleachers, seen in the picture above, remains largely intact. Although most of the original seating had been replaced with aluminum benches, a section located in the middle of the seating area had four rows of red plastic stadium seats. The concourse and concession stands underneath the bleachers dates back to Braves Field. A walkway at the end of the concourse leads from the Braves’ former offices to what was once right centerfield. 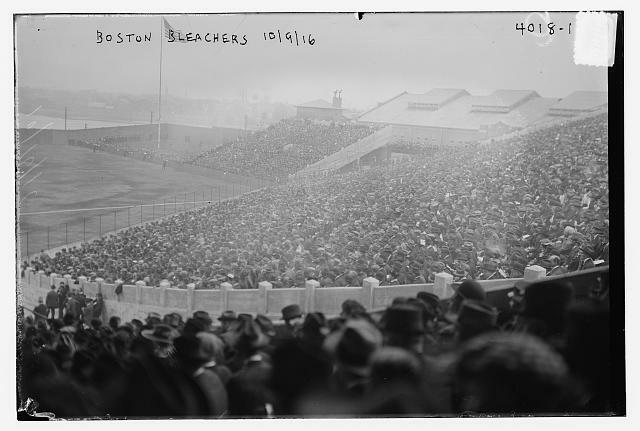 The officials at Boston University were forward thinking when they decided to turn former Braves Field into Nickerson Field and retain portions of the old ballpark for future generations of baseball fans to appreciate. It is a fantastic portal to the past and only a mile or so down Commonwealth from Fenway. If you’re in the area for a Red Sox game, it is well worth taking a detour to visit Braves Field.